Keith Meister got his wish, and shareholders of both companies should be happy he did. Well, that didn't take long. Only one month after activist investor Keith Meister suggested that Level 3 (NYSE:LVLT) CEO Jeff Storey become CEO of CenturyLink (NYSE:CTL) after the two companies merge and a period of integration passes, CenturyLink came out with a press release saying it would be so. Prior to the announcement, Storey was set to join the board, but not become an executive, and CenturyLink CEO Glenn Post was to remain CEO. Under the new succession plan, Post will remain CEO of CenturyLink in the wake of the merger while Storey comes on board as president and chief operating officer. On Jan. 1, 2019, Storey will take over as CEO and Post will become executive chairman of the company's board of directors. The deal is expected to close by Sept. 30. Activist investors don't always get what they want so easily. For instance, David Einhorn's recent campaign for General Motors to split its shares into two classes of stock was met with fierce resistance from the company and shareholders alike. In contrast to that plan, which was somewhat complicated, Meister's suggestion was both very simple and also made a lot of sense. Here's why shareholders should embrace the plan. Prior to the planned merger, CenturyLink's various businesses were half "strategic," or growth businesses worthy of investment, such as high-speed ethernet, and half "legacy," or businesses experiencing a decline in their life cycle, such as landline phone services. CenturyLink's customer composition is roughly one-third consumer-facing, and two-thirds business-facing. Level 3 is solely geared toward business clients, and post-merger, the company will be more focused on serving large enterprise customers. The combined company will become the second-largest enterprise communications provider behind only AT&T, and ahead of Verizon. Given that Level 3 is 100% business-oriented and the merged company will be geared toward large business customers, it makes sense that Level 3's leadership should have a bigger voice going forward. Perhaps the most important reason for Storey to become CEO is the terrific track record he has achieved at Level 3 since becoming CEO in 2013. The stock price chart for CenturyLink and Level 3 over that time period tells the story quite well. Storey was able to execute a turnaround at Level 3 by focusing on new ethernet, security, and cloud services opportunities, which enhanced profitability. Under his watch, EBITDA margins expanded from the high teens to the low 30s in just four years. As Meister put it, these are Tom Brady-like results. Wells Fargo analyst Jennifer Schemke, who applauded the decision, also noted, "At LVLT (and at WilTel Communications) Storey had success integrating acquisitions, developing deep sales teams, and identifying the key elements of corporations' communications infrastructure needs." Schemke also pointed to Level 3's having matched or beaten earnings expectations for 11 straight quarters. This is in contrast to CenturyLink, which has missed estimates in recent quarters. 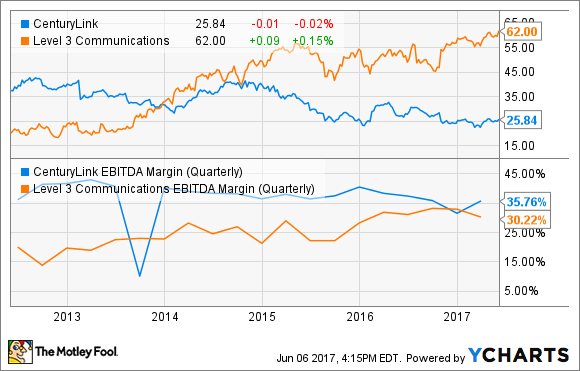 As I've previously discussed, the merger and integration of the two companies is crucial, and could precipitate a turnaround at CenturyLink, which sports a hefty 8.3% dividend yield and whose shares have lagged the market over the past year. The new succession plan gives the turnaround a much better chance of being successful, and should be welcomed by shareholders. While CenturyLink's stock surged on the news, the stock remains well below Meister's $34 target price.